Interview with Carrie from Carrie on Vegan + App Give-A-Way! Carrie Forrest is a graduate student in public health nutrition, author of the popular blog, Carrie on Vegan, and creator of the best-selling app for iPhones and iPads, Vegan Delish, featuring over 125 healthy recipes made using whole food ingredients. As a thyroid cancer survivor, she is keenly aware of the health benefits of a plant-based diet. Carrie has been vegan since 2010 based on her love for animals and a commitment to making the world a more compassionate place. Read more in our interview! Christa: Hi Carrie! 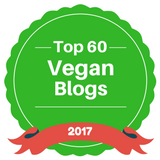 I’ve been reading your blog, Carrie on Vegan, for awhile now. I love the ingredients you use and not to mention your fresh and easy recipes! What inspired you to create a recipe app? Carrie: Thanks Christa! I’m so happy that you wanted to interview me. I’ve been blogging since 2010 and it got to the point where I had so many recipes that I wanted to either do a cookbook or a recipe app. Vegan Delish is in many ways a digital cookbook, with the added bonus of the special features like a shopping list and social media sharing and the ability for me to continually add new recipes or tweak the older ones to make them better. Christa: A recipe app is so innovative. How did you embark on creating the app? What has been the biggest challenge? Carrie: Creating the app was a huge project and it was a lot more work than I originally anticipated. The biggest challenge has definitely been the technical side and managing all of the moving parts that come with a web-based project. Also, I have to say, there are a lot of expenses that come with any big project, and I took a leap of faith to use my personal savings to get the app off the ground. Christa: What has been the response of the vegan community to Vegan Delish? Carrie: My app has been embraced whole-heartedly by both the vegans and non-vegans and I can’t tell you how much it means to me. In the first few days of its release, Vegan Delish was in the top 15 Paid Food & Drink apps on iTunes and it continues to break sales goals as the word spreads. Because of its focus on healthy recipes using whole food ingredients, I love that Vegan Delish has a broad appeal to anyone who wants to add easy new recipes to his or her kitchen. Christa: There are so many incredible recipes to choose from. Do you have a favorite? Carrie: My favorites change, but right now I’m in love with the Dessert Hummus for a healthy treat and my No-Bake PB&J Pie for something more decadent. I even created a “Summer Recipes” category for recipes that are especially good for hot weather. Those include some other current favorites including a Marionberry Ice Cream Pie (dairy-free, of course), BBQ Baked Beans made in the crockpot, and a Cauliflower Pizza Crust. Christa: Carrie, what’s the long-term goal for your app? Carrie: I envision Vegan Delish as becoming the go-to mobile resource for healthy, plant-based recipes. Just in recent months, I’ve started adding recipes from contributors that I hand-select for taste, simple ingredients, and easy instructions. Some of those recipes include Buckwheat Pancakes with Maple Cashew Cream, Almond Rosemary Crackers, Zucchini Corn Fritters, and Quinoa Mango Salad. So, the app continues to just get bigger and better with new recipes and constant improvements. Christa: Thanks, Carrie, for talking to us about Vegan Delish and best of luck in the future! Carrie has generously offered to give away three free downloads of Vegan Delish. You must be a U.S. resident, though, and have access to an iPhone or iPad. To enter subscribe to Artistic Vegan! 3 Winners will be selected at random Sunday 8/25/13 by 7 pm PST. I will email you to confirm you are a U.S. resident and have access to an iPhone or iPad. Once confirmed I'll forward your email address to Carrie with Carrie on Vegan! Carrie will be in touch with the promo codes and instructions. Thank you Carrie for your generosity! I have personally downloaded and tested the Vegan Delish app. I absolutely love it! It's very easy to use, has mouthwatering recipes, and I love the shopping list feature. I made Carrie's Berry Walnut Salad Dressing last night and it was sensational! Jerry said "Oh, yum" with his first bite. Try it out for yourself! Combine berries, walnuts, garlic, onion, vinegar, soy milk and dates in a high-speed blender and process until smooth. Learn more about the Vegan Delish App! Looking for EASY and HEALTHY plant-based recipes? Vegan Delish is the app you’ve been waiting for! For new and veteran vegans and vegetarians, plus those wanting to explore the benefits of a plant-based diet, Vegan Delish is a recipe app available for iPhones and iPads featuring over 100 recipes plus innovative tools such as a digital shopping list and searchable categories. Listed as one of the top 15 Paid Food & Drink apps in the App Store, Vegan Delish inspires users to make whole food, plant-based meals that are as delicious as they are nutritious. Each recipe in Vegan Delish features step-by-step instructions to transform simple ingredients into flavorful, health-promoting meals that everyone will enjoy. Best of all, the recipes are 100% vegan, gluten-free, and made with minimal oil, salt, or added sugars. Plus, once you purchase the app, you get forever access to all of the new recipes that update automatically. All Vegan Delish recipes are carefully selected and tested for taste, nutrition and simple instructions including mouth-watering photos. For additional information, please visit Vegan Delish on Facebook @ Vegan Delish or at www.vegandelish.com. A portion of profits from Vegan Delish supports vegan causes. If you would like more information about this topic, or to schedule an interview with Carrie Forrest, please contact her at carrie@vegandelish.com.